When we come together as a community to listen to each other, learn from one another, and commit to action, we have the power to impact both neighborhoods and lives. This is what On the Table is all about. But, we also recognize that conversation about belonging, equity, social inclusion and race can be challenging, uncomfortable and even polarizing. As you host an On the Table conversation, we want your experience, and that of your guests, to be productive and beneficial. With that in mind, we are providing additional resources. In 2017, Together Lexington hosted 12 community conversations applicable to this year's theme, where obstacles to belonging and potential solutions were discussed. Two briefs on race relations can be found here and here, and a topical summary that covers all issues discussed across the Together Lexington conversations can be found here. One of our local On the Table consultants, Reva Russell English, compiled the resources below, to provide additional background information and context for this year’s conversations. This list of resources is not intended to be comprehensive, and we recognize that individuals may have varied perspectives about their value. We encourage you to use the resources you find most helpful, and invite you to consider sharing one (or several of them) with your guests prior to your On the Table gathering. If you would like to recommend an additional resource for consideration and inclusion on this page, please email your suggestion to onthetable@bgcf.org. 1. Safety and Public Space. 2. Objectification/Caricature in Public Space. 3. Removal From/Forgotten By Public Space. For minorities and marginalized peoples, it is important to note that these three spheres are not distinct and often overlap. For example, African Americans’ safety is often threatened in public, but they may also be subjected to objectification and caricature. Additionally, their experiences, needs and contributions are often erased. Moving Poems by Claudia Rankine and John Lucas. These short films grant a visual language to Ms. Rankine’s National Book Award-winning prose poem, Citizen: An American Lyric, an exploration in the nuances of racism and prejudice in the United States. Watch here. The Case for Reparations. This article looks at the lasting effects of what Ta’Nehisi Coates calls our “compounding moral debts” regarding historical and ongoing public policy geared toward oppressing African Americans. Read it here. House Rules. This American Life explores the degree to which your zip code affects your opportunities, and the long history of redlining that still reverberates today. Listen here. Black Faces, White Spaces: Reimagining the Relationship between African Americans and the Great Outdoors by Carolyn Finney. This book considers the often-overlooked contributions of African Americans to environmentalism and conservation, as well as the fraught relationship Black people have with the outdoors, because it is often assumed to be a white space. Purchase the book here, or check it out at the library. Formation, by Beyoncé. This music video is a visual re-occupation by (mostly) Black women in those public spaces where African Americans have been historically denied entry and safety in the United States. Watch here. Being Black in Public: When you’re Black in America, you’re either seen as a problem or not seen at all. A conversation about navigating public spaces while Black between Aisha Harris, Jamelle Bouie, Gene Demby and Tressie McMillan. Read it here. CAIR: Dramatic surge in anti-Muslim incidents in 2016. This report looks at the rise in Islamophobia in public throughout the United States. Read here. Islamophobia in the USA, a documentary by Al Jazeera. Watch it here. Police Investigating Bomb Threat at Lexington Mosque, a report by WTVQ, Channel 36. On March 4, 2017, Masjid Bilal Ibn Rabah received a bomb threat in the mail. Watch the report, or read the article here. The Sexual Assault Epidemic That No One Is Talking About: For hijab-wearing women in New York, every subway platform is a danger zone. This article looks at the public safety concerns for hijab-wearing Muslim women. Read it here. A Brief History of Anti-Semitic Violence in America looks at how anti-semitism has yielded violence throughout American history. Read it here. Report: Anti-Semitism is on the Rise. This video shows the rise in anti-semitism in the U.S. and Europe. Watch here. Holocaust Denial by the Southern Poverty Law Center gives a brief explanation of the ways in which the holocaust is denied. Check it here. This is America: Speak English. This article by Andrea Gonzalez-Ramirez considers whether or not it’s safe to speak Spanish in public. Read it here. What Being Hispanic and Latinx Means in the United States. This Tedx Talk by Fernanda Ponce discusses the struggles of being Latinx in the USA, as well as stereotypes and contributions. Watch it here. A Very Long Line, by Postcommodity is an installation that shows the “the dehumanizing and polarizing constructs of nationalism and globalization through which borders and trade policies have been fabricated” while also recognizing “the indigenous peoples that are intermeshed in the theater of the contemporary immigration crisis of the Americas … who are following ancient indigenous trade routes in search of economic opportunity.” See it here. Transgender Students Avoid School Bathrooms Despite Health Consequences: Report. Because transgender cannot safely use the public restroom at school, many seek to avoid it with disastrous consequences. Read it here. LGBT Americans target of violent hate crimes more than any other group. This PBS NewsHour report highlights the high rates of violence suffered by LGBTQ people here in the USA. Watch it here. LGBTQ students feel unsafe in Ky, Ind schools. This article looks at bullying and harassment of LGBTQ youth in public schools, as well as efforts to combat it. Read it here. Queer Appalachia Oral History Project. This collection of interviews highlights the experiences of LGBTQ Kentuckians who grew up in the Appalachian region of the state. Listen here. Working in the Kentucky Statehouse. This tweet thread, by Rep. Attica Scott, highlights legislation filed by Rep. Kelly Flood to make it illegal to sexual harass anyone in the statehouse, where it is far too common. See the tweet thread here. Women’s Safety in a Violent World, a TEDx Talk by Lina Abirafeh. In humanitarian emergencies, like conflicts and natural disasters, violence against women increases. What does it take to ensure that women are safe? As she says, “Even the fear of violence is a form of violence.” Watch the video here. Safe Cities Global Initiative, a UN video, looks at the safety and lack thereof of girls and women worldwide. Watch the video here. Making Cities Safer for Women and Girls, by Kathryn Travers, Margaret Shaw, and Kassandra McCleery, a look at how urbanization has led to increases in gendered violence. Read here. Women's Safety and Security: A Public Transport Priority, this report by Todd Litman explores why women are often exposed to threatening and unwelcome behaviour when using public transport, as well as potential solutions. Read here. Examples of Racial Microaggressions. This chart gives examples of microaggressions that different racialized people experience in public. See it here. Microaggressions: More Than Just Race, by Derald Wing Sue. This article looks at how people marginalized for reasons other than race can also experience microaggressions in public. Read it here. Asian-Americans often feel racial 'microaggressions.' In this report, Karene Booker summarizes a Cornell study that looked at the effects of microaggressions for Asian-Americans. Read it here. Microaggressions Matter is a look at how microaggressions reveal deeper problems in America and the public realm. Read it here. Why Do We Call Asian Americans the Model Minority? A look at a pervasive stereotype by the people affected by it. Watch here. 7 Microaggressions Trans People Face in Health and Mental Health Care. Read the list here. This is what it's like to fly while very fat, a tweet thread. Read it here. Pounds of Flesh: On Being Fat In Public. This article gives real-life examples of what negotiating public space is like for someone who is above “normal” weight. Read it here. The Difference Between Body Positivity And Fat Activism. Virgie Tovar talks about how to improve the body positivity movement by looking at it through a justice-centered and intersectional lens. Watch here. Being fat, a tweet thread. 20+ observations from Kivan Bay. Read the thread here. Eating While Fat is a blog about the performative aspects of eating in public when you are above “normal” weight. Read it here. Affrilachia by Frank X Walker. Read the poem here. Why Media Must Stop Misrepresenting Appalachia by Ivy Brashear, a look at the ill effects of Appalachian objectification. Read the article here. Surviving a Post-Coal Economy, a video by MACED (Mountain Association for Community Economic Development). A look at some of the economic struggles facing Eastern Kentuckians. Watch the video here. Stranger With a Camera, a documentary film by Appalshop that looks at the sometimes violent consequences of media portrayal of Appalachia. Watch it here. Which Side Are You On? Written by Florence Reece 1931, this iconic pro-union, pro-worker, anti-capitalist fight song still inspires and represents well the land- and people-lovers in Appalachia, who are routinely ignored by mainstream media in favor of a view of Appalachia as homogenous Trump country. Listen here. Being An Undocumented Black Immigrant In America Is A ‘Lonely Experience’ looks at what life is like for a person who doesn’t fit the “profile” of being “undocumented.” Read it here. On Because It's Time with artist, Adriana Ortiz-Carmona! In this short video, Adriana Ortiz-Carmona, an undocumented, queer artist talks about one of her paintings. Watch here. Motherhood, a personal essay by Joanne Grant where she tells of her struggles to raise her children without enough money. Yuu can find it among other exceptional essays in Toni Cade Bambara’s, The Black Woman: An Anthology. You can find a pdf of the essay here. Faces of Poverty, a Single Mother. This video shows Adrielys and her two sons as she tries to juggle parenthood, childcare and employment. Watch the video here. Stereotyping single mothers is not new – its history, and how to challenge it. This blog focuses on how single mothers and their children are stigmatized and how that stigma exacerbates their struggle to get what they need. Read more here. Minority, Single-Parent Families and Poverty, a clip featuring Sandra S. Smith regarding why so many children live in poverty. Watch here. Concerto no. 7: Condoleezza (working out) at the Watergate, by Nikky Finney. This poem reveals the extremely high standards Black women must achieve to excel in the US, as well as what it costs them. Read it here. America is Failing its Black Mothers. The maternal mortality rate among Black women in the United States is at crisis levels. Harvard Business Review looks at why. Read here. The Black Woman’s Quiet Fear and Rage. This article by Bianca Spriggs looks at the experience of being a Black woman in the South. Read it here. The Uses of Anger: Women Responding to Racism. Audre Lorde’s classic essay on race and gender. Read it here. Hidden Figures. This movie looks at the overlooked contributions of African American women to NASA. Watch the trailer here. Vanished, a short documentary by The Atlantic, looks at Lissa Yellowbird-Chase’s work to hunt down missing and murdered indigenous women. Watch it here. The Missing and Murdered Indigenous Women and Girls from Across the U.S. This NPR interview with Annita Lucchesi focuses on a report she co-authored that highlights the alarming absence of data gathered around native women and girls who go missing or are killed. Listen or read the transcript here. 13th, a documentary film by Ava DuVernay that highlights the historical and current intersections between capitalism, slavery and incarceration. Watch on Netflix here. 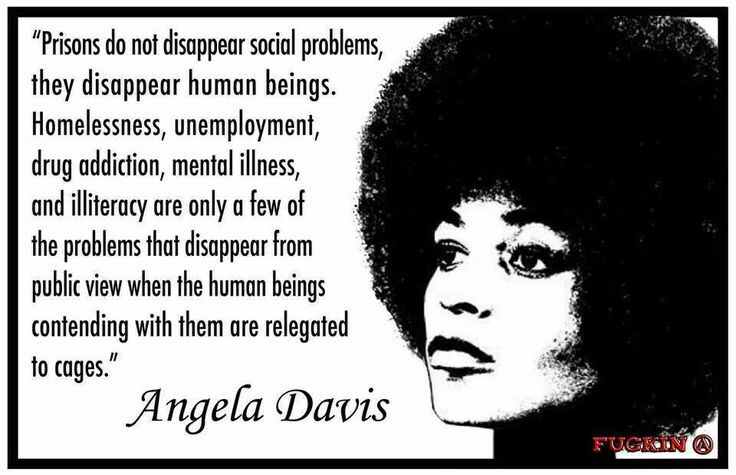 Prisons do not disappear social problems, a meme with a quote by Angela Davis. See/read it here. Press Release for the National Prison Strike, August 21st - September 9th. A list of demands from the Incarcerated Workers Organizing Committee. Read the tweeted press release here. Felon Voting Rights Bill, from KFTC (Kentuckians for the Commonwealth). Over 300,00 Kentuckians are denied full participation in civic life — even after they’ve served their time. Read more here. There are Thousands of Cyntoia Browns, an interview with Mariame Kaba on Democracy Now! A look at Cyntoia Brown’s murder conviction and clemency through the eyes of a prison abolitionist. Watch here. Transcript also available. Incontinence is a Public Health Issue — And We Need to Talk About It, by Mari Ramsawakh. This article discusses how the lack of discussion, policy, etc. relating to incontinence negatively affects those who have it. Read it here. 23 Things That People In Wheelchairs Have To Cope With. This Buzzfeed list sheds light on life in in a wheelchair. Read it here. Where Should Special Needs Kids Be Special? This article asks questions about how the abled and the differently abled should approach public space. Together or apart? Read it here. #ThingsDisabledPeopleKnow Check out this hashtag on Twitter to find out things folks with disabilities know about life in public space dominated by the abled. Check it here. Ageism in the workplace: What older workers can do to stay employed. This article looks at how growing older places workers at a disadvantage and the efforts they must make to stay employable. Read it here. The Harmful Effects of Ageism. This report looks at how ageism negatively affects, not just those considered “too old”, but everyone. Watch it here. Healing the Epidemic of Isolation for Senior Citizens. This TEDx Talk by Elissa Altman discusses the importance of sharing meals with senior citizens facing lives of isolation. Watch it here. 20 Facts About Senior Isolation That Will Stun You, a list from the Senior Living Blog on a Space for Mom. Read it here. East Nashville Homeless Encampment To Be Cleared Out, a news report from WTVF, Channel 5 in Nashville. Where do people experiencing homelessness go when developers take over the space they call home? Watch the video here. What It’s Like to be Homeless in Lexington, Kentucky by Josh Nadzam. Two community members explore life without housing with the help of a woman and her daughter, who are currently experiencing homelessness. Read the article here. Charleston Bans Sitting, Lying Down Along King and Market Streets, reporting by Abigail Darlington for The Post and Courier. The city takes aim at those members of the population who panhandle and lack stable housing. Read here. 7 Kids, 1 Apartment: What Poverty Means To This Teen, a podcast by Jairo Gomez and Radio Rookies. Hear what life is like for a teenager in New York City living in poverty. Listen here. How Family Separation Traumatized Children, a mini documentary produced by The Atlantic looks at how children have been affected by family separation at the Southern border. Watch it here. Nilda’s Story. Learn why one young woman fled her home country and what she and her two-year-old son encountered when they arrived in the USA. Watch it here. or call us at 859-225-3343.